Description: NS Eastbound Doublestack Train 24E rumbles through Waco, Ga. Description: 21G heads west with it colorful consist elephant style. Description: A pretty nice lookin consist gets a good roll out of Northtown. Description: Easton WA was the Northern Pacific's primary helper base on the east side of the Cascade Mountains and Stampede Pass. Where there was once a large yard, roundhouse and wooden coal dock there is now only about 3 tracks and units to help get grain trains over the pass. Here a four-unit helper set drifts back into town after working to get another westbound over the mountain. The crew will jump in the crew bus to the left when done. 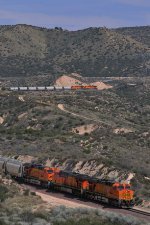 Description: Trailing on the rear of an eastbound manifest heading for Cajon. Description: BNSF 7728 and 7705 at Watson yard. Description: A view of the south-end of Watson yard from PCH. The marine layer was heavy this day. Description: BNSF roster is 7728, 7705, 7713, 7761, 7701, 7700, 7757, 7719. 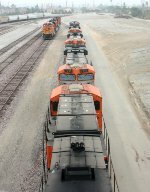 Description: A west bound BNSF train of covered hoppers coming gingerly down the steepest track on the hill, formerly track 3, the two tail end DP engines seen above the leading engines. Description: Empties and loads roll west toward Grants, NM. Description: And the trains just keep coming. A westbound heads toward Grants, NM.